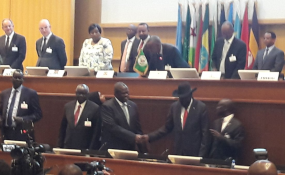 South Sudan's President Salva Kiir and former deputy-turned-rebel leader Riek Machar signed a peace agreement on the sidelines of a regional summit in Ethiopia. After months of back and forth, President Salva Kiir and rebel leader Riek Machar have inked a final peace deal. Western ceasefire brokers remain skeptical that the pair can stick to a ceasefire agreement. After a series of false starts, South Sudan's President Salva Kiir and former deputy-turned-rebel leader Riek Machar signed a peace agreement on Wednesday, on the sidelines of a regional summit in Ethiopia. An earlier peace deal signed in 2015 broke down after a year, when clashes broke out between rebels and government forces and Machar was once again forced to flee the capital Juba. The new accord reinstates Machar to his former role as vice president. The western powers overseeing the deal, Norway, Britain, and the United States, were cautiously optimistic about the deal, have previously expressed skepticism that Kiir and Machar were the kind of figures that could be entrusted to maintain peace.